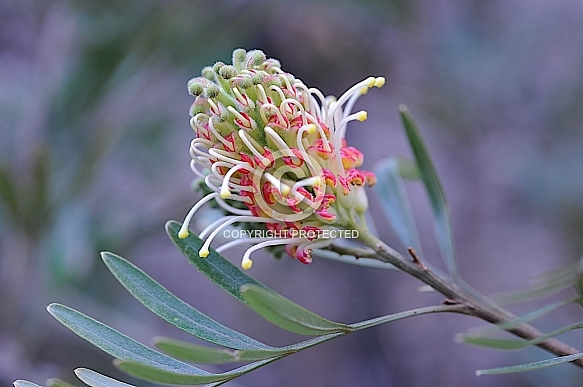 Description: 'Hot Lips' is a distinctive selection of Grevillea banksii. This is an extremely variable species with the many variants and hybrid cultivars often quite different in habit and flowering time to the original species. The most commonly grown form is known as ‘Fosters’ or G. banksii var. forsteri (a botanically incorrect name) which flowers year round. The large flowers are a rich, pinkish-red shade and both red and cream-flowered prostrate forms are grown. The latter forms are often grafted onto G. robusta rootstocks to form spectacular weeping standards. This species is an important parent of many well-known, large-flowered hybrid cultivars, such as ‘Robyn Gordon’, ‘Ned Kelly’, ‘Superb’, ‘Misty Pink’, ‘Coconut Ice’, ‘Peaches ‘n Cream’, etc.